I'm planning this one (plus upcoming projects for Detective and Sensation Comics) to be fairly brief. In this project, I'll be covering the Superman stories from Action Comics #1-12. If someone would care to pick it up from then, please feel free. Action Comics #8 - "Superman!" We open in juvenile court, as one Frankie Marello attempts to defend himself from a charge of assault and battery. The judge is about to sentence him when Frankie's mother intervenes, making a plea on her son's behalf, saying that his environment is why he's so tough, but that with a second chance he'd have an opportunity to overcome his upbringing. Clark Kent is in the courtroom, and while he agrees with the mother, he suspects the judge will not be forgiving. Frankie's gang are also watching as the judge sentences Frankie to two years in the boys' reformatory. Frankie's gang blames someone named Gimpy, and plan to meet that evening to discuss what to do. Kent overhears them talking and decides to investigate as Superman. Later that evening, Superman listens in on the boys' meeting. Apparently Gimpy is their fence and promised that he'd protect them if anything ever happened, and now that he didn't help Frankie, they're pretty ticked off. They decide to go and visit Gimpy. They head over to Gimpy's junk shop where he's working that night. The boys burst in on Gimpy counting money, and ask him why he didn't spend some of it on a lawyer for Frankie. He tells them that business has been bad, but the boys are not going to be dissuaded. One of them grabs a heavy wrench from a nearby table. Thinking desperately, Gimpy hands each boy a slip of paper with an address on it--each address is a place where they can make a huge score that evening. The boys take the slips and head off to do the crimes. After the boys leave, Gimpy calls up the police to tip them off to the burglaries, in order to get rid of them. However, Superman interrupts Gimpy during the call, hanging up the phone. Superman roughs Gimpy up a bit, then tells him he has one hour to get out of town. Gimpy agrees to leave. Superman then races off to save the boys from the police. One of them is interrupted by the police, but Superman snatches him away. The two of them go to save the next boy, but he's already been caught. Superman chases down the prisoner transport and lifts up the back, causing it to stop moving. He then frees the boy from the back (aiding and abetting), then takes both boys to rescue the others. Superman catches the next boy in the act of stealing silverware from someone's home. He returns the silverware and takes the boy with him. Finally he stops the last boy before he can complete breaking and entering into another house. Superman takes the boys back to the tenements and tells them he wants to talk with them. He explains to them how Gimpy has been taking advantage of them the whole time, and that Gimpy was the one who tipped off the cops to their evening burglaries. The boys get angry and decide they want to do something about Gimpy that very moment. Gimpy has been listening in to their conversation, and he's armed with a rifle. He begins shooting at the boys. Superman stops the bullets. He then grabs Gimpy and tosses him into the river. One of the boys sneaks up behind Superman and hits him in the head with a wrench, but it has no effect. Superman then gathers the boys and tells them he's going to put a little fear into them. He leaps up to the telephone wires and does a balancing act while holding the boys, pretending to lose his balance several times. He then leaps high into the air with them before bringing them back down to the ground. Then he asks the boys if they want to do that again. Being teenage kids, of course they tell him yes, because it was fun. Superman relents, and the boys tell him they want to be just like him. Superman wishes there was more he could do for the boys, ad he feels it's their environment that's making them turn out this way. He then overhears a newsboy shouting about a cyclone that's wrecked several communities and left many homeless, and that the government would rebuild quickly. This gives him an idea. Superman has the boys run around to the various tenements and tell those living there to vacate their homes and take all of their valuables. After they've left, Superman destroys the tenements )destruction of private property). As the residents flee, they tell the police that a maniac is destroying their neighborhood. The army infantry rushes in to intervene, but are unable to stop Superman. A squadron of bombers comes through next and does much of Superman's work for him. Superman leaves, and sure enough, the government builds new low income housing in the area. Later, Clark Kent interviews the chief of police, who tells him that they're trying to apprehend Superman, but secretly they're glad he did what he did. Ah, now here we have the "mad lunatic" Superman that I remember. I can certainly appreciate what Siegel and Shuster were going for here, but this story is almost as bad as All-Star Batman and Rogin the Boy Wonder. I'm not going to get into the argument as to why the kids are delinquents, but rather deal with the story elements as presented. These kids are pretty much hardened criminals as this story begins and not much happens to change that. They still assault Superman even after he saves them from Gimpy and other than lip service it's hard to say that they've changed at all. Speaking of Gimpy, I'm amazed that he survived being tossed into the river, and that Superman didn't at least restrain him for the police at some point. Then of course, there's Superman's efforts at "urban renewal" which are also pretty ridiculous when you get right down to it. You can understand his reasoning, but it leaves a large number of people homeless for a lengthy period of time (I'm sure those high-rises didn't spring up overnight), not to mention that it didn't really fix the problem of the neighborhood being economically disadvantaged or the inhabitants not having the wherewithal to change the situation. I could forgive all of this if the story was a little more fun, but it's really pretty mediocre in it's execution. The excitement of previous issues just isn't there. Anyway, sure this is what I expect from Siegel/Shuster Superman, and it's well meaning, but the story just doesn't hold water. Action Comics #9 - "Superman!" We open in the office of the Chief of Police. He's telling the press that since Superman destroyed a block of tenements--no matter what the purpose--that the police intend to bring him in. The assembled reporters laugh until the Chief tells them that he's bringing in a specialist--one Captain Reilly from Chicago. While all other attempts to apprehend the Man of Steel have failed, Reilly has a 100% success record. As Reilly preens for the assembled reporters, Clark Kent is there, and he's unimpressed with the Captain. He whispers to another reporter that Reilly is a "conceited windbag". Reilly hears this whisper and wants to fight Kent, who backs down. Reilly then declares that he'll capture Superman in two days. Later, at the newspaper office, a photographer who was also at the press conference tells Lois all about what happened. She calls Clark a coward(because, you know, anyone who doesn't want to fight a police detective must be yellow, right?). Clark comes by Lois' desk later to remind her that they have a date that evening, and Lois gives him the business, telling him that she loathes him. Clark then accuses her of being in love with another man, and Lois admits her feelings for Superman. Clark walks away seemingly dejected and Lois--to her credit--thinks she may have been a little hard on Mr. Kent. She then thinks that she despises him, so it doesn't matter. Meanwhile, Clark walks into an empty office where he finally allows himself to guffaw about Lois' crush on Superman. Back at police headquarters, the Chief is getting a little annoyed with Captain Reilly, who's seemingly doing nothing but sitting at the Chief's desk and smoking his cigars. Reilly tells the Chief he's been thinking, which causes the Chief to go into a tirade. The Chief demands action, and this gives Reilly an idea. He calls all of the newspapers, offering a $5000 reward for information leading to the capture of Superman. This infuriates the Chief, but Reilly explains that this is always his first action, and that he intends to collect that reward himself (one gets the feeling that Reilly isn't the most...ethical of police officers). The next day, Lois reads the paper and sees the reward offer, as well as an amateur detective, Mortimer Snoop, who very much wants that reward. Meanwhile, at the hospital, one of the mental patients escapes the hospital staff and wants to jump to his death. The hospital staff radios the police, and overhearing the report at the newspaper, Clark Kent asks his editor if he can cover the story, and receives approval. At the hospital, Clark changes into Superman in an alley in order to rescue the patient. However, he's observed by Snoop. Thinking of the reward, he runs to call the police, telling them that Superman is at the hospital. Reilly rushes to the scene and connects with Snoop, who shows him where Superman appeared and the empty set of clothes left behind. Reilly decides to stake out the alley way and wait for Superman to return. Snoop accuses Reilly of trying to cheat him out of the reward (which he is), and Reilly suggests he should run along because of the likelihood of violence when Superman gets there, but Snoop won't leave, as he doesn't trust Reilly. The patient jumps, and Superman manages to catch him before he hits the ground. He returns the patient to the hospital staff then heads back for his clothes. However, he spots Snoop and Reilly staking out the alley. He decides to wait and see what happens. Reilly pretends to leave the scene in hopes that he'll be rid of Snoop, and Snoop does the same. However, as they return they run into one another again. Reilly is about to give Snoop what for, but then Snoop notices that the clothes are gone. Reilly chases Snoop away. However, Snoop is smarter than Reilly gives him credit for; he'd searched the clothes and found a memo in the pocket that Reilly didn't see. It's a reminder to attend a society dinner that evening. Snoop plans to go as well, since Superman will be there. Snoop attends the party, but they won't let him in without an invitation. He calls the Daily Star (I think this is the first mention of the newspaper's name) and asks to speak to the Society Editor. Lois answers the phone, and Snoop tells her that if they can get her into the party that he'll give them the scoop. Lois agrees to help him, but when she arrives at the party she's admitted but tells the doorman that she doesn't know Snoop. Frustrated, Snoop then calls Reilly, who comes down right away. Snoop tells him that if he can get them into the party, they'll be able to get Superman. Inside the party, Lois runs into Clark. She tells him that she's never been happier to see him in her life, confusing Clark as the same woman told him a few hours earlier that she despised and loathed him. She tells Clark that someone discovered that Superman would be at the party, and she needs Clark's help to locate him. He asks her how would he recognize Superman, and why should he help her out after the things she said to him earlier today? Reilly and Snoop blow past the doorman, and Snoop suggests that since it's likely Superman is wearing his costume under normal clothes, all they need to do is search all the men until they find Superman. Lois sees them and remonstrates Clark for not helping when there was still time. Clark has issues of his own--he is wearing his Superman costume under his suit and he hopes they don't search everyone. Reilly announces his presence and tells the partygoers that this time Superman won't get away. Snoop makes certain that everyone knows he's involved too. As he lines up the men, Clark smarts off to him. Reilly begins searching the men but Snoop interrupts him. He asks Reilly about the reward. As they argue, Reilly informs Snoop that he has no intention of sharing that reward at all. He tells Snoop to go away. As Reilly is about to search Clark, Snoop angrily turns off the lights. Reilly gets the lights back on shortly, and who should appear but Superman? Reilly and Snoop both attempt to capture him, but they are unable to control him. In fact, they knock themselves unconscious attempting to tackle Superman. Lois watches the scene, unhappy that she has no chance to talk with Superman. 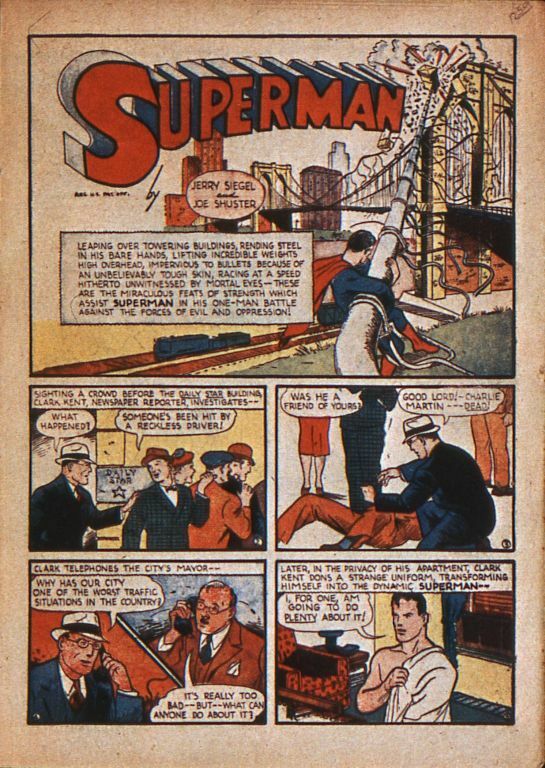 The next day, the headline of the Daily Star indicates that Reilly has left town, unable to capture Superman. This was an attempt at a more humorous Superman story I suppose, and it sort of works, but it's missing the action that one would like to see from a Superman tale, at least at this point in his publishing history. The story more or less meanders along and doesn't have the momentum or pace of previous stories. I do appreciate the nod to the previous issue's continuity however. Lois watch: I can appreciate that Lois is spunky and aggressive, but she could also be much, much nicer. Once again, she displays why I've never been that fond of the character--a lot of times, she's just plain mean, not to mention incredibly fickle. Here, she's definitely got the "mean" on full display. Action Comics #10 - "Superman!" A man calls the editor of the Daily Star and requests that they send a reporter for a great story, but doesn't say what that story is. The editor realizes it's probably nothing, but sends Clark anyway. When Clark arrives at the address, the man who called before greets him and ushers him inside. He tells Clark he has a great story but asks Clark not to reveal his identity. Clark agrees. The man then removes his shirt, showing Clark a chest covered in welts. Clark asks how he got the welts, and the man explains that he received them working on a chain gang in Coreytown. He escaped to tell someone about the brutal and cruel conditions there. Clark agrees to write the story, and it's published the next day. Shifting scenes to Coreytown, we see that what the man said is true, as a prisoner is whipped nearly to death for committing the sin of being too tired and injured to work. While the whipping occurs, one of the men tells the boss that the Governor is there to investigate. He tells his subordinate to hide the man he's been whipping while he deals with the Governor. The man--named Wyman--goes to talk to the Governor and declares his innocence. He takes the Governor to see some of the men working and asks them to tell the Governor if any of them have been mistreated. One of them wants to speak up, but another of the inmates warns him that if he does, Wyman will kill him in a slow and lingering fashion. The Governor leaves, thinking that the newspaper printed a bunch of lies. After the Governor has left, Wyman's man lets him know the prisoner he whipped has died of his injuries. Wyman does not care, and he's figured out who must have given the newspaper the information--Walter Crane. He plans to go North and find Crane. Wyman goes to see the editor of the Daily Star and demands a retraction, but the editor refuses as the information came from a reliable source, and that he should sue if he wants to. Wyman then asks to talk to Clark Kent, and the editor calls him in to his office. Clark enters, and Wyman attempts to intimidate him to find out where he got his information. While Clark hems and haws, he refuses to give that information to Wyman. His editor backs him on this. Wyman then reveals that he knows the informant was Walter Crane, Clark still won't tell, so Wyman threatens him with arrest as he's harboring a known criminal. Clark--playing his role as a coward--then tells Wyman where to find Crane. Clark takes Wyman to see Crane. As soon as Crane opens the door, Wyman attacks him. He tells Crane he's taking him back to Coreytown. Crane looks to Clark, who tells him that he's sorry. Clark returns to the Daily Star, where all of the other employees are disgusted with him. Of course, Lois is as hot as the rest of them, although this time I can understand. Clark goes to the editor's office. The editor is ready to give Clark the chewing out of the century when Clark stops him and asks for a moment to explain his actions. He tells the editor that he did it so they can get actual photographic evidence of Wyman's cruelty and crimes. His editor agrees, and after changing to Superman, Clark heads to Coreytown. In Coreytown, Superman disguises himself and intentionally gets into a car accident with Wyman, which escalates into a fist fight. A police officer arrests the disguised Superman, who is given six months on Wyman's chain gang. 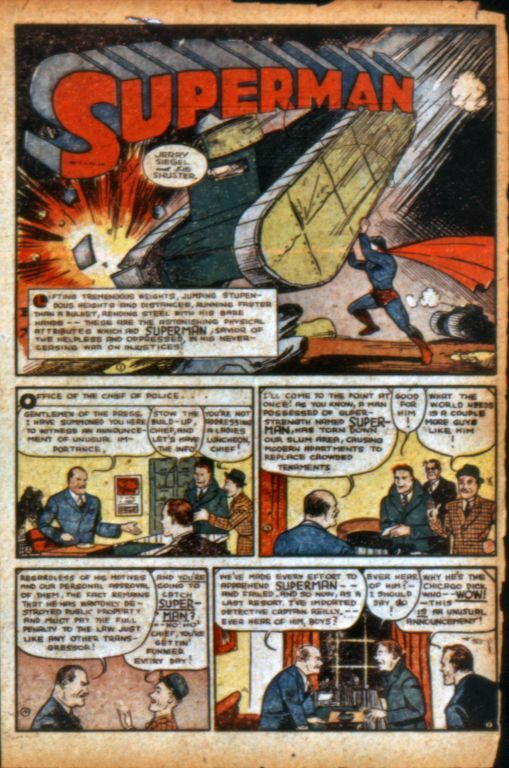 Arriving at the chain gang, Superman is immediately put into stocks at Wyman's order. Wyman hopes to break the spirit of his new prisoner, but the punishment has no effect upon Superman. Superman is released from the stocks and put on the chain gang. He's given what appears to be an impossible task, but easily completes it. He's given double the number of rocks to bust, and does so quickly. That night, Superman escapes from the prison and changes into his Superman suit. He also returns with a camera, taking photos of the stocks as evidence. However, he's startled by a commotion--it's Crane, escaping. Wyman sends bloodhounds to chase him. Crane makes it over the wall and continues running, but eventually runs into some quicksand. Superman saves him, then fights off the bloodhounds. He returns Crane to the prison, then gets photos of Wyman whipping him. After Wyman finishes whipping Crane, he has Crane tossed into the sweat box where he's locked in. He's taunting Crane with food when Superman finally intervenes. He puts Wyman in the sweat box after releasing Crane. Superman then kidnaps the Governor, bringing him back to the prison. He then tells Wyman he's going to plug up the air holes in the sweat box so that he suffocates and dies just like Wyman has done to other prisoners. Wyman then confesses his misdeeds, and Superman leaves him to the Governor. The next day, back at the Daily Star, all is well and Kent is back in his editor's good graces. This story rubs me the wrong way. Yes, Superman does the right thing, but his methodology is extremely suspect. There was absolutely no reason to either tarnish Clark's reputation, nor to put Crane at risk. He could easily have just gone to Coreytown, waited until he got his evidence, then published the evidence. I do think it's interesting to see a story about prisoner mistreatment. 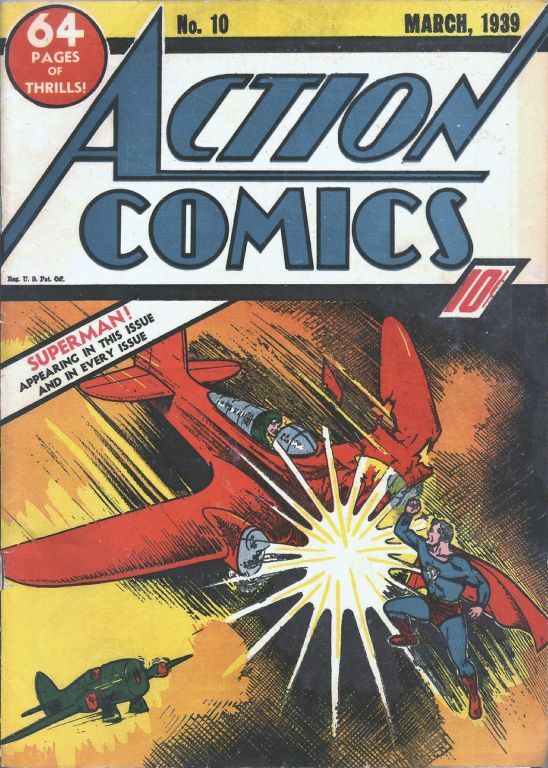 Action Comics #11 - "Superman!" Clark and other reporters are hanging around the police station looking for stories on a slow news day. A call comes in that someone has committed suicide at his broker's office. While that seems fairly routine, Clark decides to investigate. They go to the broker's office--one Meek and Bronson--and get the story. Seems the victim had had some heavy losses and decided to cut his losses. Clark notices the dead man clutching his shares in one "Black Gold Oil Well". Hearing this, another man pokes his head in and accuses Meek and Bronson of murder. Clark ushers the man out of the office, then asks him what's going on. The man tells Clark that Meek and Bronson bilked himself and many others out of large sums of money by selling them worthless stock. That evening, Superman decides to investigate Meek and Bronson. He sneaks into their office and locates a list of investors in the Black Gold Oil Well. The next day, a disguised Superman--using the alias Homer Ramsey--goes to visit one of the investors, offering to buy his stock. The man warns him that the stock is likely worthless, but Superman buys it anyway, at a profit for the man. he repeats this the rest of the day until he has all of the stock and his bank account is empty. Superman then travels to the oil well. Disguising himself again, he asks for a job. The foreman laughs at him, telling him that there's been no work at the well for months as the owners find it more profitable to sell stock than to actually drill for oil. superman returns to the oil well that evening. After subduing the night watchman, he sets up the drilling equipment himself. However, after a few hours and no results he thinks he's failed. Just as he's ready to walk away, the well produces oil. He leaves, and the workmen begin working the well. The foreman gets on the phone to Meek and Bronson in Cleveland (I guess Metropolis hadn't been invented yet, and given that Siegel was from Cleveland, this makes sense). He tells the brokers about the well's sudden success. The brokers had thought that the well was a dud. They think they're rich, but they need to buy back the stock they sold before. However, as they contact each of the investors they discover that a Homer Ramsey had purchased the stock from them earlier. Meek and Bronson go to see Ramsey in his newly rented office, but Ramsey refuses to sell. As they leave, they decide to contact some shady characters named Louie the Rat and Nate the Snake to persuade Ramsey to sell. They exit their taxi at a dilapidated hotel, but Superman has been following them. The brokers go to visit the aforementioned ne'er do wells and tell them they want Ramsey dead. Superman using his X-Ray vision and super-hearing (the first mentions of either, I believe) overhears the whole thing and plans to teach them a lesson. AS the brokers return to their car, they find it wrecked and on it's side. Back at Ramsey's office, Louie the Rat and Nate the Snake beard Ramsey in his office. They take him away at gunpoint, take him to a deserted road and then gun him down. However, since it's Superman, he then turns the tables on the crooks. Bronson hears his doorbell later that day, and finds Nate and Louie stretched out unconscious on his doorstep. There's a note from Homer Ramsey stating that the men are there with his compliments. After the two men tell him what's happened, Bronson tells them that they're lousy shots. He then calls Meek and heads over to his place. En route, Ramsey jumps into his car for a chat. He tells Bronson he's decided to sell. he then tells Bronson the price for the stock is one million dollars. Bronson tells him he's crazy if he thinks he'll get that sort of money, but Ramsey tells him to take it or leave it. Talking to Meek later, he thinks that the price is too steep. However, Bronson has had a change of heart and thinks that since they'll both make several million on the deal that it will be worth the purchase price. He calls his broker and has all of Meek and Bronson's assets liquidated to raise the million dollars. They go to Ramsey's office and give him the money, then tell him that the stock is worth millions. As they leave, they wonder if there's a way they can get the million they paid back. Meanwhile, Ramsey changes back to Superman, as the role of Ramsey is completed. Superman busts into Bronson's house later that evening and roughs him up, then kidnaps him (he does this a lot during this period of publication). He then goes to Meek's house and repeats his actions. He then takes them to their newly purchased oil well and destroys it. He then causes the oil to burn. Superman returns to Meek and Bronson who realize that they're now wiped out. He tells them to stop selling stock. He heads back to the city, and we see Clark and his editor discussing their situation after they've been bankrupted. This isn't a bad story, although it does have some flaws--for instance, how does Superman rationalize not arresting the two hit men--but there's another problem that I realized as I was going through the story. This is beneath Superman in many ways. Up until now, we've seen Superman overcome armies, heavy equipment, etc. While doling out just desserts to two crooked businessmen isn't a bad thing, there's really no tension in this story whatsoever. There's no challenge. The panels more or less mark time until the resolution. It's not exciting. This is not to say that one needs to provide Superman with a physical challenge to make a good story--in fact, I think the best Superman stories I've read have him dealing with problems he can't easily overcome through the use of his powers--but this is just too easy. Action Comics #12 - "Superman!" Clark arrives at the Daily Star building to find a large crowd. He asks what's going on and someone tells him that someone was killed by a reckless hit-and-run driver. Clark goes to see who it is and it turns out to be one Charlie Martin, someone that Clark knew. Clark calls the Mayor of the city demanding to know why the city has such a big problem with reckless drivers. The Mayor admits the situation is bad but that he can't really do anything about it. Clark decides that Superman will do something about the problem. The first thing he does is break into a radio station and commandeer the live microphone. He then issues a proclamation that he's declaring war on reckless driving before leaving the station (FYI, he doesn't use a door at any point here, entering through a window and leaving through a wall). Superman then heads to the car impound at the county jail. He proceeds to destroy all of the vehicles there (I'm guessing not every one of those vehicles belonged to someone guilty of reckless driving). After leaving the vehicle impound, he next goes to a used car dealership. After telling the dealer that his cars are dangerous wrecks, he destroys all of them as well. Meanwhile, the police are being so inundated by calls from the public that they have every available officer trying to track him down and stop him. The Mayor threatens the police chief's job if he can't stop Superman's reign of terror, and the Chief rightly tells him that there's not much they can do to capture Superman. Superman spots a drunken driver recklessly moving through traffic. Superman picks up his car and after jumping over several moving vehicles, he then leaps off a bridge and onto another bridge. He checks inside the car and sees the driver passed out. Superman is suddenly hit by a driver who doesn't stop. The driver's passenger urges him to stop, but he won't. Superman chases the car down and hops into the back seat, pretending to be the ghost of the man the driver just hit. He promises to haunt the driver as well, scaring the bejeepers out of him. Satisfied that he's terrorized another citizen (albeit one that actually deserved it), Superman then travels to the factory of one of the top auto manufacturers. He asks the CEO why so many of his cars are involved in bad accidents, then tells him that it's because of the inferior materials used to make the cars. The owner asks him what he'll do about it, and of course, Superman proceeds to destroy the factory (putting who knows how many people out of work). Superman then returns to the radio station. Once again, he commandeers the microphone to tell the listeners that his rampage is in earnest. Traveling through the city, Superman spots a police officer who's pulled over a speeder. 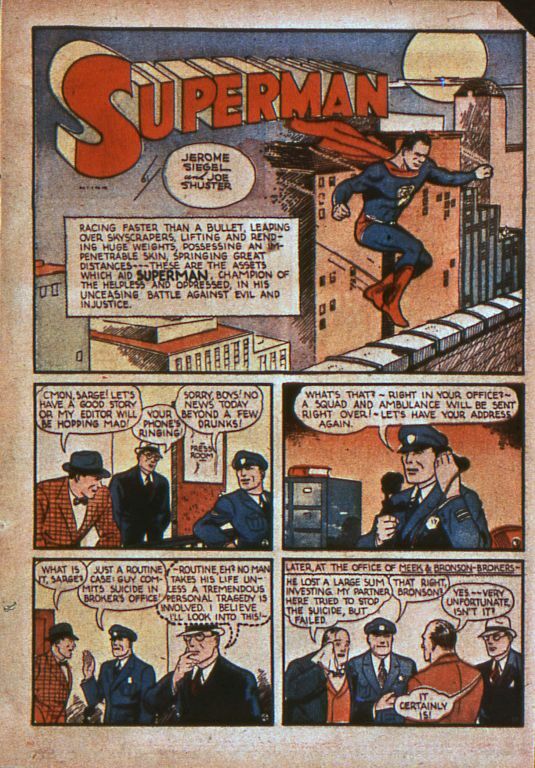 The driver attempts to bribe the officer, but the officer sees Superman and arrests the driver for his attempted bribery. Superman moves on, then comes across a dangerous mountain pass. He builds a bridge that eliminates the dangerous curve. Back at the Mayor's office, he's fed up and leaves in frustration. He gets into his nice car and speeds away. Superman joins him and pushes him into the passenger seat. Superman then takes the wheel and starts driving the car faster and faster. The Mayor asks him if he's trying to get the two of them killed, and Superman tells him why not? After all, by not strictly enforcing the traffic laws, he got a lot of people killed himself. Superman then grabs the Mayor and jumps out of the car(we don't see what happens with the very fast speeding automobile, but I wouldn't be surprised if it caused some sort of really nasty accident that killed or injured some innocent people). He takes the Mayor to the morgue, and shows him the bodies of people killed in car accidents. 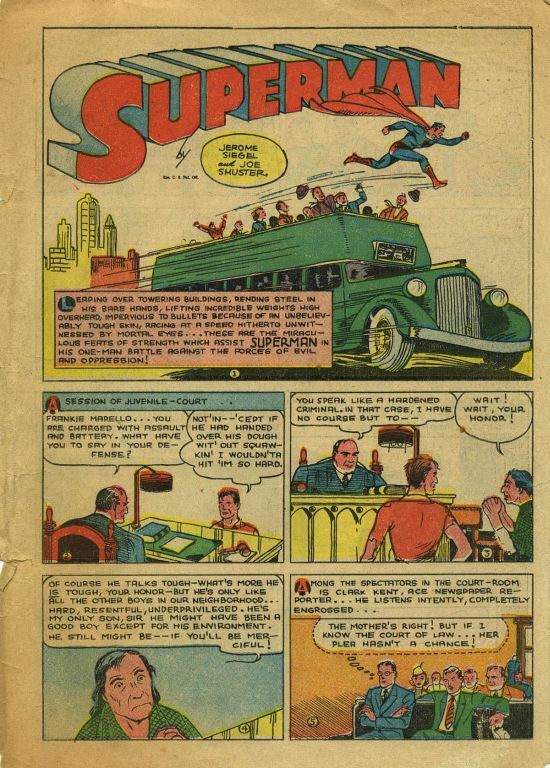 The Mayor is appalled and asks Superman what he can do, and Superman tells him he can do a lot by making sure that the driving laws are strictly enforced and that irresponsible drivers don't get licenses. The Mayor vows to make changes. Superman goes home and changes to Clark. He drives to the Daily Star, but his editor sends him right back out to City Hall to cover the Mayor's new traffic initiatives. As he leaves the Daily Star, a police officer gives him a ticket for parking illegally. Clark secretly thinks that his plan worked. This story is very difficult to rate. Part of me finds it absolutely hilarious, another part of me is horrified by Superman's actions (not stopping the drunken driver or building the bridge, but rather his wanton destruction of property). Ultimately, this is the sort of direction Siegel really wanted to go with Superman, and perhaps was also the beginning of pressure from editorial to change the tone. There's a huge difference between standing up for the downtrodden and destroying car factories, and given the popularity of the series, it wouldn't surprise me if a different direction was soon undertaken.If you look at Superman's actions in this story, he shows complete disregard for the rights of anyone, and likely causes more problems by tying up the police and destroying the factory than he's righting. So,this ends this particular reading project. What did I learn? I suppose the most interesting parts was how different a character Superman was back then as opposed to now. He certainly wasn't the Big Blue Boy Scout, but operated on the absolute fringes of legality. Decidedly vigilante at this point, he mostly worked in a pro-active fashion to right society's ills rather than to uphold society's order. There's definitely an appeal to the former, but I'd have to say that a lot of the execution left something to be desired. Sure, he's a fascinating character, but after the initial excitement and the breakneck pacing, it just seems as if the stories drifted into mediocrity. As I recall--if I were going to go further--that changed when Superman's first recurring foe--the Ultra-Humanite--was introduced. I have been following your thread but haven't been commenting because I can't actually read along. Without digging out the reference (probably in Men of Tomorrow by Gerard Jones), I remember there was a court case in which Jerry Siegel said he hadn't read Gladiator by Philip Wylie. It sounds like he was writing Gladiator. I want to say that's correct. A lot of my information about Superman's early days was informed by Men of Tomorrow.